One of the benefits of maintaining a site like this is you can always reference dates of past occurrences. I can link to this entry from December 9, 2005 in which I mentioned the big snowfall we had. 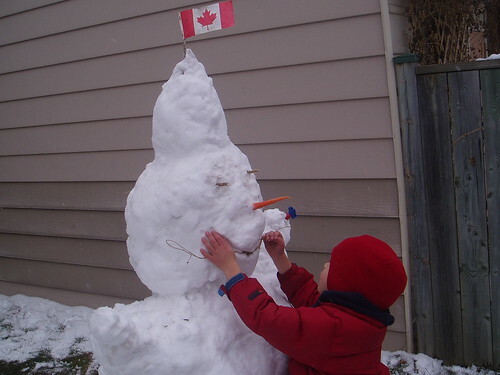 I can also link to this picture of the snowman James and I built on December 10 and this entry from March 13, 2006 in which I mentioned the fact we never had a decent snowfall after that so we were never able to build another snowman. On that March day it was 13° and we were coming off the warmest winter on record. We're ten days from Christmas and we're expecting a high of 11° this weekend. Snowmen in this city are an endangered species. I don't want to sound like an old coot telling the kiddies how tough it was in my day, but I'm certain we had a ton more snow. At least we had snow, I think. I remember snow. I don't have the stats handy, but if you go more than a year without being able to produce a half decent snowman in the city of Toronto, there might just be an inconvenient truth in need of attention. Mr. Snowman, you are missed. I'm pretty sure we had one of the coolest summers that I can remember. Possibly an inconvenient reality check. Climate change takes millions of years, not 2 decades. At this rate the Ice caps will be melted in 50 years, FYI. Watch "An Inconvenient Truth"
FYI, Tee, climate change doesn't simply involve everything getting warmer. It involves weather that is out of the ordinary, an interruption of the usual trends, and a general imbalance in the environment. This past summer WAS an example of climate change.